Ormond is deeply committed to being a sustainable campus. The Master, Rufus Black, outlines our recent initiatives and plans. There is a new view from the Tower as solar panels glint in the morning sun. 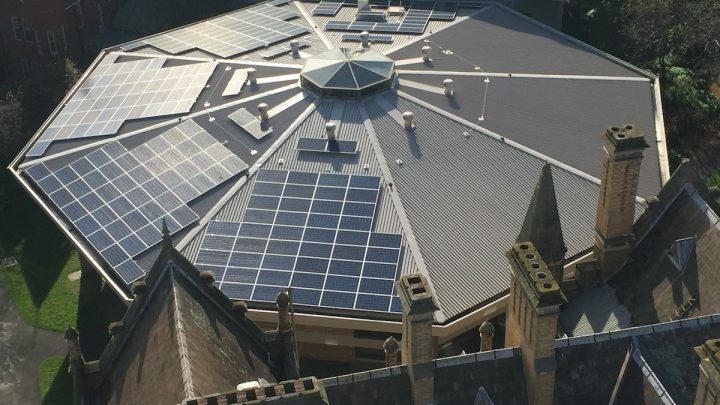 Spread across the north and western sides of the Academic Centre and McCaughey Court, solar arrays are powering the College. They are the visible part of the latest step in Ormond’s continuing sustainability program. Complementing the solar arrays has been a major three-part initiative to reduce our electric power consumption so that our solar power covers a greater part of College requirements. The first step has been to switch all the College’s lighting over to LED technology, from rooms and corridors to outdoor lighting and public spaces. While we have changed the technology, we haven’t changed the look. The second step has been to install voltage regulators. As our engineers explain to me, voltage is like water pressure and electricity distributors ramp it up well above what is required so they can ‘squirt’ power longer distances – and then they charge us for the extra energy they deliver. The result is that we receive more power than we need and the excess energy also shortens the life of electrical equipment. Voltage regulators put a stop to this so that we only receive the energy we need. The third step has been to generate building by building energy data to enable staff and students to see how changes in their use eg not having devices on standby help reduce consumption further. While bringing our electrical energy use down we have also been working on reducing our gas consumption. Again, there are three major initiatives we are taking. First, we are progressively introducing highly efficient new European boilers. Instead of a single large boiler that heats the water all at once, they are a series of smaller boilers so that we only heat the volume of water we actually require. Second, we have installed a sophisticated control system for our boilers to reduce the demand they create period of peak use, which is both an energy and a financial saving. Third, with gas hot water has principal for of heating we are work to make our older buildings more energy efficient. Old windows are being replaced by tightly sealed double-glazed units. The look is unchanged, but the performance is very different. In addition to energy we are concerned to reduce on water consumption. Long-ago we installed more efficient shower heads and installed in our kitchen a highly water efficient dishwasher. Our latest initiative is to put in a very intelligent control system for watering our recently relayed Picken Lawn. The system gets data on moisture levels so we water optimally but also gets forecast data so we don’t water when it is about to rain. With our new building works we have aimed to exceed the required standards and with the Wade Institute building we have aimed to set the standard. The Wade building is the first large Australian educational building constructed to the European Passivhaus standard, which is 9 stars in Australian standards combined to meet current best-practice requirements of 6 stars. The super-insulated and intricately sealed structure with all LED lighting uses minimal energy for its operation. Its large overhangs and triple-glazed windows make it a wonderfully light space while still being extraordinarily efficient. Mini heat-exchange air-conditioning units throughout the building mean that, despite its careful sealing, there is more fresh air than in an average building but at virtually no energy cost. The Wade and new Graduate buildings respond to sustainability challenges in other ways as well. All the water that falls on their roofs, including the tennis courts on the Institute building, is captured on site. Some of it fills the new pond between the Institute and Graduate buildings. Once full, the pond flows down a small cascade, which brings with it the delightful sounds of running water, to a billabong from where it can slowly drain away. Around the billabong and spread out across the old Wyselaskie lawn are over a thousand new plants and trees that are creating an urban woodland. This woodland of Indigenous flora adds a whole new experience to the grand and colourful border of Main Drive, the recreational space of Picken Lawn and the European garden of roses and bulbs around Allen House. Importantly, the wood adds new habitats for birds and, with the addition of the ponds, we have already seen ducks. Our new buildings have all been constructed on the old carpark and tennis court spaces so that we didn’t take away any green space, and now we have been able to add a major new garden. The design brings students and staff into an immediate relationship with the garden. Indeed, this has proved so successful that the smaller teaching space in the Wade building has named itself the Garden Room because that is what students were calling it.